Women’s flat track roller derby is nothing like the old school theatrics our parents may recall watching. It isn’t full of big hits and sucker punches on a banked track. It isn’t all short skirts and fishnets. Roller derby today is a competitive, strategic, serious sport that requires more than most mainstream sports - and gives back in ways unlike any other. 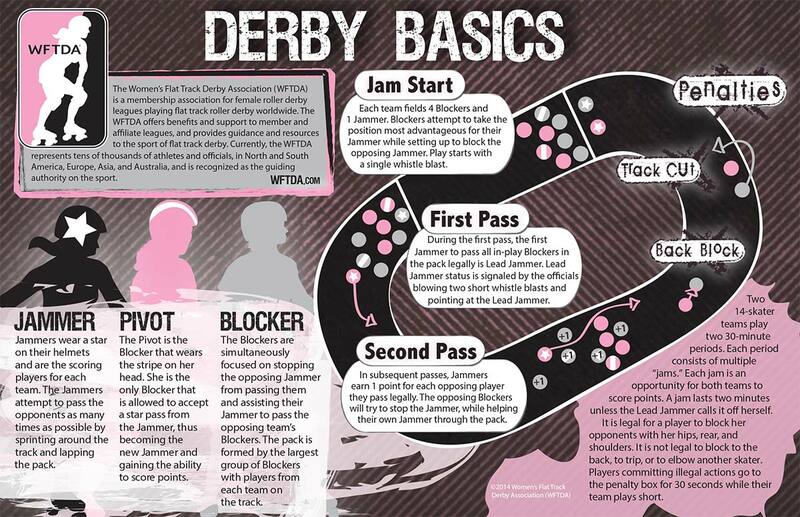 The Women’s Flat Track Roller Derby Association (WFTDA) began in 2004 under the title United League Coalition (ULC), but changed its name in 2005 “to reflect the organization’s goals,” according to the WFTDA website. For sure, the grassroots of this sports revolution are determined to be taken seriously. The year 2006 marked the creation of competitive national divisions, and a quarterly ranking system to determine tournament seeding. And in 2015, ESPN even agreed to air some of the games on ESPN3 for public viewing. The women participants of this sport are striving to be, as the mission statement declares, “Real. Stong. Athletic. Revolutionary.” But there is still a good portion of the old school feel that can be seen on the track - for instance, the names of some skaters may give you a good laugh: Licker ‘n Split, Brawn Swanson, Frisky Biscuits, Scald Eagle, Dr. Octopushy, Freight Train, Satan’s Little Helper, Short Stop and V-Diva are just a few names of the top level athletes who skated in the 2016 WFTDA championship tournament. To see full roster lists of more names, look up the all-star teams of the leagues mentioned below. 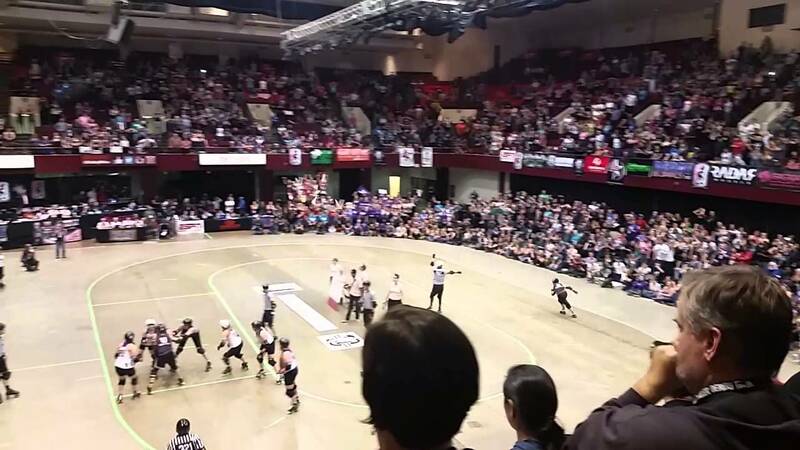 Earlier this month, the 2016 WFTDA international championships took place in Portland, Ore. Teams from across the nation and the world fought each other for possession of the Hydra Trophy, and the title of 2016 WFTDA champions. Denver Roller Derby, Arch Rival Roller Derby, Angel City Derby Girls, Montreal Roller Derby, Minnesota Rollergirls, Jacksonville Roller Girls, Texas Rollergirls, and Rat City Roller Girls played in the first round of the tournament while London Rollergirls, Gotham Girls Roller Derby, Victorian Roller Derby League and Rose City Rollers had a bye. The four teams with a first round bye all advanced to the quarter-finals, but a couple with only slim margin victories. 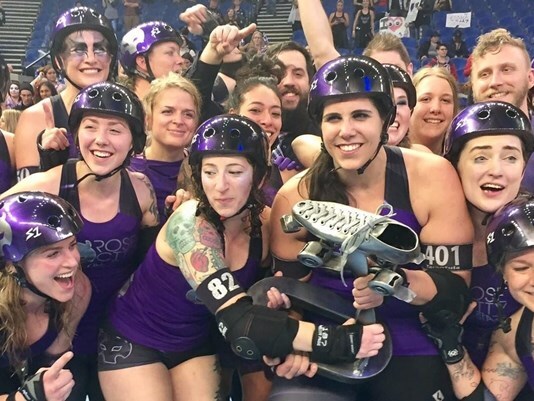 The semi-finals presented teams from London, New York City, Australia and Portland and although only two advance, any one of these teams could be the WFTDA champ. However, the final bout came down to Gotham Girls of NYC and Rose City of Portland. This was the exact same stand off the year before with Rose City winning the 2015 title. The battle was fierce and each team played their hearts out, but in the end Rose City remained victors and held onto the Hydra for one more year. Sami Ebner, a UH Hilo alumna now skating within a recreational league of RCR’s program, attended the championship tournament and posted: “And we keep the hydra another year #wftdachampionships” to her Facebook page after the host team won the tournament. But what motivates these teams to fight each other on the track, beyond a competitive nature and a will to win? For some it’s passion, fulfillment, success, fitness, a challenge. For Rose City, it’s more. “This phenomenal man has been a pillar of the Rose City Rollers and greater roller derby community for years,” according to Rose City’s website. Robin “Rob Lobster” Ludwig began as a volunteer official and eventually became a travel team coach. He stood by RCR since the team’s inception in 2004. In 2014, Rob was diagnosed with glioblastoma, a very aggressive form of brain cancer. In 2015, just three weeks before the WFTDA championships, Rob passed away. His team went on to win the title, for which they credited him. Roller derby is more than just fun, competitive, and full of gnarly bruises. It’s a family. It’s full of crazy women - doctors, therapists, single moms, college girls, scientists, and bartenders. You name it, we got it. It’s camaraderie at its finest. It’s sarcasm at its sharpest. It’s tears of joy when your team wins a championship, and tears of sorrow when a league loses a member. But it’s about coming together and giving, so that others may experience the vastness the sport brings as well.